The Diaries of a Glam Mama: Why, we're in the news! Why, we're in the news! I'm back from Hong Kong! Our trip was pretty fabulous, and I will definitely write more about it later, but first I want to talk about one of the highlights of my trip that actually happened a couple of thousand miles away, back home here in Malaysia: Afraz and I were in the papers! As I mentioned in a previous post, I had been interviewed and shot for the Ratu section of Berita Harian about a week ago. Well, the article came out on Tuesday, and I was in HK at the time. My mom got a few text msgs that morning from her friends, informing her that we were in the papers. I quickly went online and read the copy. So excited!! I was kinda disappointed that I couldn't see the article in its entirety (pictures and all)...but I didn't have to wait long before my friends took pictures and scanned the article and put in on Facebook :D Thanks a million, Aishah and Haslinda! I am still so over the moon about this. What a great opportunity for Malaysian Babywearers and the entire babywearing community here. I don't think Berita Harian, and the wonderful reporter Siti Nur, realize what a great public service they've done for parents, parents-to-be and, more importantly, the BABIES in Malaysia! I hope that this article will have reached out to parents who wouldn't have otherwise heard about babywearing, and helped quell some of the (frankly, quite bizarre) stigma that babywearing parents have had to face here. No more bibik comments please! Unless your bibik looks as good as that carrying your baby ;) The actual link to the article on Berita Harian is no longer available, but you can find the text here and here (Thanks again, Aishah, and also Syahidah!). Some people asked for a "behind-the-scenes" account of the shoot and interview. Its nothing fancy, I assure you, but I'll oblige! After our phone call, Siti (the reporter) sent me an e-mail with a list of questions that I could answer via e-mail before our actual face-to-face interview. We figured this was the best way to get the vital facts across in case things should get too chaotic at the shoot itself (which, since it included my children, it kinda did). The shoot actually went well, considering the craziness that comes with my two boys, hahaha. Aqil was happy to be in the humongous studio, and he found a bunch of balloons, so he was all set. Afraz, on the other hand, was pretty pissed off that he couldn't play with his big brother, and had to "work" instead *LOL*. I bet the photographer had a tough time choosing the photos to include in the article, because he was pretty unhappy for most of the shoot! The pictures turned out great, though, and as per the comments on Facebook, Afraz does look genuinely happy to be worn. For those who are wondering why those particular carriers were featured (ringsling and mei-tai), well actually Siti and the photographer were the ones who chose it. Mostly it had to do with aesthetic value, I think, and in the case of the step-by-step directions, user-friendliness. I brought my whole stash, and those two were the ones that were chosen. Hopefully in the future we will have another opportunity where we can feature other carriers :) The initial idea was to have Afraz and I posing with the ringsling, and then Aqil and I for the mei-tai. But Aqil was too busy playing, so we went with Afraz all the way (with a break in between shots to change a poopy diaper). We joked that Afraz was the actual diva on set, not me! All in all, I am super happy with how the article came out. I look forward to more mainstream media coverage of babywearing in Malaysia! Speaking of, I am such a bad bad bad person for forgetting to blog about another important media outlet that covered babywearing in Malaysia recently! 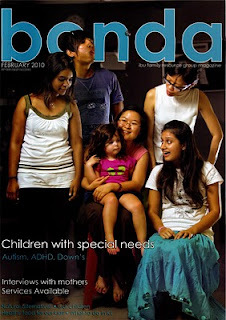 I wrote an article for Bonda magazine and it came out in their February issue. I've mentioned about babywearing to A WHI TV3 journalist in January. They came to interview me for a slot in WHI and at that time I had a baby basket with JumpSac's ring sling..so siap demo sikit lah cuma my babygirl tido tapi still boleh agak2 lah (I gave her 3 contact numbers of 3 BW-gear makers). Two years ago when she came for Nona pun I ada sebut tentang cloth diapers. But no news on both yet la..
Where I can get the BONDA magazine? Millie: Thanks! Wow, it would be great if that worked out and babywearing & CDing could reach the masses. congrats, dah jadik celebrity yer skrg...have a good weekend! Iz: Yeah, Thani boleh!! Hahaha. That pic of Farhan & the kids was not meant for public consumption, lol. But I had to put it in - tandem babywearing in my own home...very proud of it la! 'Aidah: Nanti I sign autograph ya. Hantar via airmail. Hahaha!